The Collegiate Church of St Peter at Westminster, known as Westminster Abbey, is located on the north bank of the Thames in London. It was originally a Catholic Benedictine monastery, built in 960 AD, expanded in 1045, built in 1065, 1220 Reconstruction was carried out in 1517. Westminster Abbey was the Catholic Benedictine Church until the King’s founding of the Anglican Church in 1540. After 1540, he became an Anglican church. Westminster Abbey was constructed from 1050 to 1065 to complete. Since 1066 it has been the coronation church, with the exception of Edward V and Edward VIII. At the heart of the current church, which began in 1245, is the shrine of a St. Edward the Confessor. 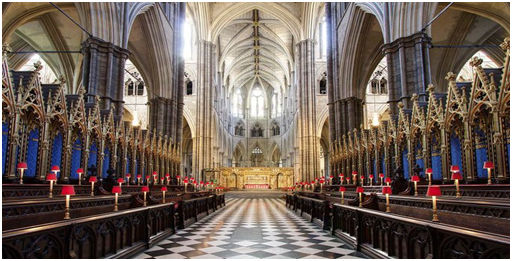 Many major figures from England’s history are buried at Westminster Abbey. Westminster Abbey is one of the most magnificent churches in the world. Its exterior is dignified and beautifully decorated. The whole building is magnificent and serene, and is considered to be a masterpiece in English Gothic architecture. It witnessed the millennium vicissitudes of the Thames, triggering the unlimited feelings of tourists. It is not only the best Gothic building in the UK, but also a rare historical museum.